"When I see an Alfa Romeo go by I tip my hat" - Henry Ford. 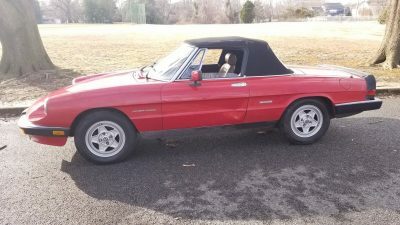 Get the same experience with this 86 Alfa Spider Veloce. 1986 Alfa Romeo Spider Quadrifoglio, Alfa-red with red and grey interior. Excellent body. 1988 Milano Verde This listing is marked as sold. 1988 Graduate, red/brown, Calif. Car, 132k miles, A/C, recent rebuilt trans., no leaks, no rust, uses no oil, like new interior and top, Quad 15” wheels, good tires, tools, jack, owner’s manual and repair manual. $6500. Dave, Indiana. alfa@davestrus.com 765-437-2491. 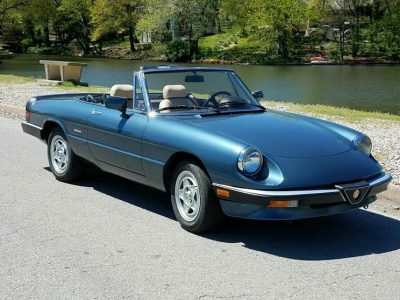 This beautiful 1986 Alfa Romeo is for sale. We searched the entire country to find a nice rust free example with a clean title. After an exhaustive search this car was located in San Francisco Bay area - flew out to buy it and drove it back across the country with zero problems. 1986 SPIDER QUADRIFOGLIO Verde 57,600 miles, Incl Hard Top. Excellent body, no rust.